Earth is home to more than 30,000 known species of fish, which is more than all the other species of vertebrate animals combined. Fish are amazingly diverse and truly fascinating. Did you know, for example, that fish are fast learners with long-term memories and a keen sense of time? They recognize other individuals, can keep track of complex social relationships, and work cooperatively with other species. Fish are inquisitive, perceptive, and personable. 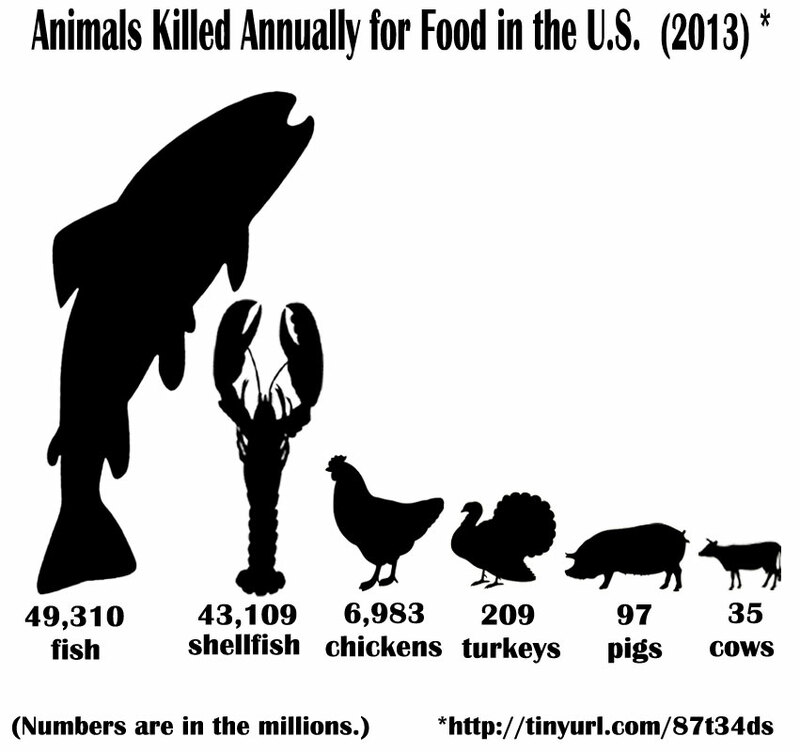 Sadly, fish are the most misrepresented and misperceived animals. For example, the absurd but common notion that fish have “a three-second memory” should be blown out of the water by the fact that migrating fishes, such as salmon, remember their way home years later and from thousands of miles away. Others, including goldfish, can learn and remember skills. One is even noted for it in the Guinness Book of World Records! Also contrary to popular myth, fish can suffer fear and pain, as has been scientifically shown. Far more fish are exploited than any other category of animals, and they are subjected to the worst abuses. Yet, fish have the least legal protection and receive the least concern for their well-being, even from the animal protection community. Globally, an estimated one to three trillion wild-caught fishes and 37-120 billion farmed fishes are killed commercially for food each year. Hundreds of millions more are killed for “sport” each year in the U.S. alone. Fishes are also increasingly replacing other animals for scientific experimentation. 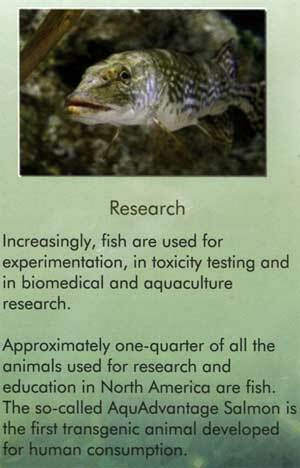 Approximately one-quarter of all the animals used for research and education in North America are fish. Additionally, some 1.5 billion are used for aquariums. 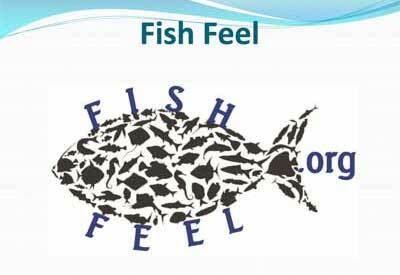 Fish Feel is the first organization devoted to promoting the recognition of fish as sentient beings deserving of respect and compassion. Fish Feel primarily serves to help educate the public as to why these animals are deserving of our admiration and appreciation, the immense problems caused by the exploitation of them, and how we can help them. Music: ‘Nuturing the Spark’ by Bobby Cole; Jamendo Licensing. Fish Feel and SHARK expose the merciless slaughter of cownose rays for prizes, entertainment, and competition on the Patuxent River in Maryland. Mary Finelli of Fish Feel, who chairs the Save the Rays Coalition, said advocates are confident a compromise can be reached, though she personally prefers the House version. "The Coalition fully supports the moratorium on these cruel and wasteful contests while more research is conducted,” she said. 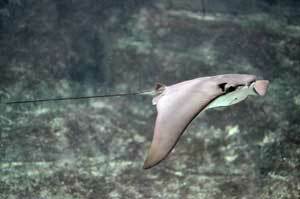 Animal protection groups are asking the Maryland Department of Natural Resources to prevent bowfishers from carrying out yet more bloodbaths on native and beloved cownose rays of the Chesapeake Bay – another cownose ray killing "contest" is set for June 26, in Solomons, MD. Promoting dolphin captivity to very young children through a toy is unacceptable. This playset is teaching children that dolphins exist strictly for human entertainment and will likely create a desire to see these animals in captive environments. Feel article in the current (Spring 2014) issue of Pathways magazine. In consideration of this publication’s audience interests, the health hazards of consuming fish and fish oil are emphasized. Pages 39-41. Pathways is a quarterly journal and resource guide for the greater Washington DC area. Ethologist Jonathan Balcombe, Ph.D., a returning guest, and Mary Finelli, founder and director of Fish Feel, will astound you with their fascinating conversation with Victoria Moran about what humans have very recently learned about the lives and sophistication of beings who live in the water. December 11, 2013, podcast. The Third Annual Bethlehem (PA) VegFest was held September 7, 2013, was a wonderful all-vegan event with an estimated attendance of 10,000 people. Fish Feel's exhibit was well received, and we made many great new contacts there. You can see our booth, which is the first one in the photo. "It really just goes to show you the type of depravity that these killing contests generate," said Mary Finelli of Silver Srping. 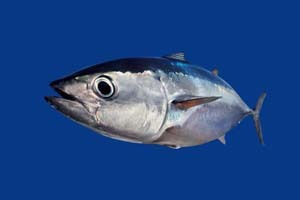 Her group Fish Feel helped SHARK try to draw attention to what they said is an inhumane contest that needs to be banned. 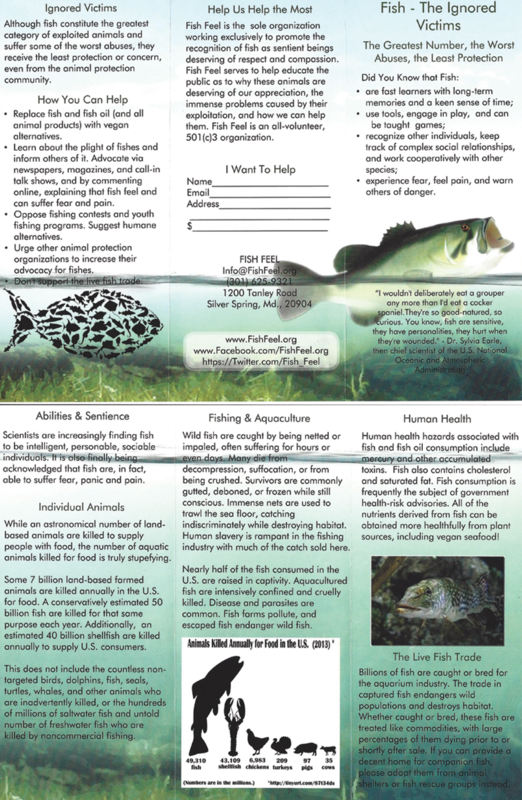 Fish Feel is a 501(c)3 nonprofit organization. All donations are tax deductible to the full extent allowed by law.